Utility rooms are all about home functionality. Plan electrical supply with this in mind and consult local building codes. Wood workshops, laundry rooms, and man caves! This is the third in a residential wiring series of articles. The previous article examined wiring a bathroom. The article previous to that looked at wiring a kitchen This one discusses how to wire a utility room. Utility rooms are extremely important rooms in the modern home. Theyre not always pretty, but they are the work horses of the home. Utility rooms are laundry rooms, workshops, a garage being used as a man cave, or occasionally, detached sheds. Utility rooms are generally work rooms. Because of this, builders often dont do much in the way of finishing them: bare concrete floors, exposed home wood framing lacking sheetrock, and a utility grade light fixture on the ceiling. Because of this and the fact that physical activity takes place here means that special considerations should be taken when wiring a utility room. The question of how to wire a utility room is best answered by considering the rooms functionality. Like all home electrical work, its important to consult with the local electrical building code before beginning to wire a utility room. Local building codes vary by area but some things are common. Its safe to say that they all require using Romex or nonmetallic (NM) cable. If, after you review the code, you discover that you dont want to do the work or youre required to have a licensed electrician do the job, I recommend I highly recommend Angies List - Ratings, reviews and sometimes revenge. See what local homeowners say about the service companies they hire. Wiring a workshop requires as much planning as building or remodeling a kitchen. Why? Because there will be a lot of activity in a workshop. Wielding lumber and slinging tools around mean that electrical receptacles and light switches need to be strategically positioned. Where will the work bench be placed? Although plenty of lighting should be spread throughout the workshop, overhead lighting at the work bench is critical. Track lighting with low-voltage halogen or LED bulbs is ideal. In many cases, installing undercabinet lights is the right thing to do. The work bench also needs a minimum of six receptacles. Use GFCI receptacles to avoid overloading and to protect yourself in the event of liquid spills. Always consult the local building code prior to wiring a laundry room. Most have some very specific things to say about laundry room building codes; this is a place where its important to understand home electricity. With that in mind, it is only logical to locate the washing machine and electric clothes dryer receptacles behind and above them. This is critical where the washer water discharge is located. Obviously, just as when planning a bathroom, a GFCI receptacle should be used around water. An electric clothes dryer will need to be placed on its own dedicated 120/240-volt receptacle. 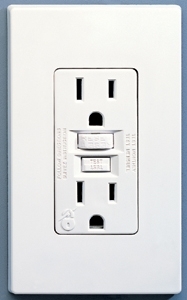 All electrical receptacles in the laundry room should be placed on dedicated 20-amp circuits. A two-bulb, four foot fluorescent fixture mounted on the ceiling should provide plenty of lighting in a typical laundry room. With the small amount of juice it will pull, it can share a circuit with an adjoining room. When it comes time to plan on wiring a man cave, simply follow the same logic used when wiring a living room. For placing receptacles, draw out on paper where to position the big screen TV will go, as well as the refrigerator and slot machine!